On June 16, 1858 Abraham Lincoln spoke these prophetic words to his peers assembled at the Illinois State Capitol in Springfield: “a house divided against itself, cannot stand”. Lincoln won the presidency of the United States and a civil war provoked by slavery, an abomination known by the recent ancestors of many Aboriginal Australians. Lincoln’s seven words launched countless political science theses, and to this day his observation remains a moral actuality among those who aspire to the highest of offices. I do not know if the Leader of the Opposition Bill Shorten pondered Lincoln’s words when he began his Budget Reply speech in the Australian Parliament on April 4 2019. But across the despatch box neither Shorten nor the nation, could ignore the self-evident truth of a government utterly divided against itself. Shorten’s first five words “women and men of Australia” is a deliberate riff on Gough Whitlam’s famous aphorism, “men and women of Australia.” Whitlam’s memorable saying marked the beginning of Australia’s transformation from colonial backwater to one of the most intriguing societies ever to occupy an entire continent. While the full transcript includes Shorten’s response, Sales’ observation poses a raft of questions about how we view ourselves. No matter who we elect I doubt Australians will ever be fully content with who we are as a people, and the nation will likely continue as “a house divided against itself, [and thus] cannot stand”. Shorten alluded to the answer during his speech. In the words of the American author Ken Kesey, it is a great notion whose time is yet to come. But the idea is given short shrift by media, and the majority of the women and men of Australia know virtually nothing about Makarrata. I have not read one media report on the Budget Reply Speech which reported Shorten’s reference to a Makarrata. I find this odd given the Uluru Statement is a modern Australian rhetorical masterwork. Consider this. “How could it be otherwise? That peoples possessed a land for sixty millennia and this sacred link disappears from world history in merely the last two hundred years? 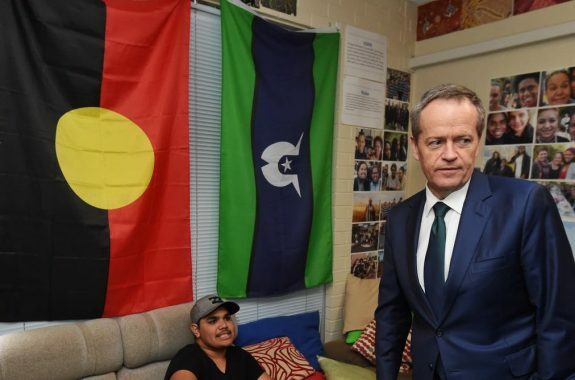 “With substantive constitutional change and structural reform, we believe this ancient sovereignty can shine through as a fuller expression of Australia’s nationhood. Herein is the difference between a conservative right-wing party bereft of ideas and a centre-left party within a whisker of government and led by a man characterised by a senior ABC journalist whose “personal popularity is a bit lacklustre”. The Makarrata link was informative (paragraph 12). It is time to think/dream about what can be done rather than why nothing should be done. Inspirational and generous in spirit. The media want leaders who are all bells and whistles, who can be put forward with great fanfare, criticised and pulled down again. It sells. Give me a leader who expresses the views of the people he/she leads, who can synthesise different views, find common ground and make a difficult decision and defend it. Shorten seems lacklustre because he works quietly to develop ideas that stem from consultation and negotiation within his party, and he takes little interest in rhetorical sparring and sniping at his opponents. I agree. Bill is also better unscripted because he is well-informed and arguing for things he believes in rather than things the marketing and image people recommend in response to what is said on 2GB and Sky After Dark. Coalition politicians, by their own admission, don’t even know what they are voting on. The backflip on giving the energy one-off payment to Newstart recipients is a prime example of how the Coalition thinks and operates. Bill campaigned well last election. He is a member of a competent team. They have better policies. As he said, they offer hope. I truly hope they don’t disappoint us. Well said Henry, and it is rare these days we hear such wisdom in the Australian Parliament. There have been a few profound declarations in the last few days but not one has come from the Liberals, Nationals or any of the bogan right, just more excuses to support hate speech, division, coercion and privilege, mostly half illiterate, unsupported, indefensible and utterly irrational, that is after the disingenuous games, overtures and sermons of Morrison, post Christchurch and the authenticity of Jacinda Arden leadership. “A house divided against itself, cannot stand”, Abraham Lincoln, Springfield 1858. 1) What does this mean for the Liberals, their politic, electoral ambitions and whose interests they serve? 2) What does this mean for the Nation, our first nations people and multicultural Australia, for all of us? And when you are done with that, is there any doubt in your mind who you should vote for, or at the very least who you should NOT be voting for? Populism, media acridity, mediocrity, self interest and popularity stakes will not cut it, not for wise and fair governance of a nation, and not for our planet and everything that lives and breathes upon it. Jon Chesterton. If the ALP win the election then the Liberal apparatus must face the questions you pose. And more broadly, so must we the people. A sizable portion of the population, Bogans included, despise anything Murdoch and his minions deem “left”. As the Liberal Party has changed the national identity in the last six years, so too must the ALP seize the moment. Shorten appears to have a strength of character underestimated by opponents and media alike. We need big pictures painted our national canvas. Makaratta is a start. Then a Republic perhaps even a Bill of Rights. Not so much for the here and now, but for 100 year’s hence. I was in the Young Liberals (shame and embarrassment) when Gough Whitlam replaced Arthur Caldwell. Some people expressed fear that this young popular ‘messianic ‘ leader would give the great unwashed some real hope at the next election. However we were addressed by a wise ‘elder statesman’ of the branch who said that Sir Frank and our other friendly newspaper proprietors would crush this pretender ensuring our stable sensiblly run world would continue…. It reminded me at the time of A World Of Our Own, a song by The Seekers. I have been critical of Bill Shorten but am really warming to the party’s way of promoting the policy not the leader …. Australians aren’t used to this having adopted the worship of the demigod style of politics in the last couple of generations. What Turnbull said was typical conservative blockage, attacking inclusiveness, social participation and enjoyment transcending the repressive politics of power and control. I can’t get past the sort of mean-spiritedness that operates on that level. Only the differences, only divide and conquer. Some people ask “why not” but Dickensian people like Turnbull dismiss something better with an unyielding “no”. What a desolate, misanthropic place must be the inside of their heads be. I think you will find Abraham Lincoln borrowed the “house divided” quote from the Bible. Regarding Bill Shorten. I was talking with a lady a few days ago. She is a Long time Labor voter but said, “You know, I never really could take to Bill Shorten. Then I went to one of his town hall meetings and he is very impressive.” I think we should vote according to policies and not personalities. However, unlike a lot of my friends, I like Bill Shorten. My only real beef with him is that he keeps saying “0vver when he means”other”. People’s poor perception problem probably stems from the fact the the Murdoch media and its conservative affiliates always portray him negatively. Case in point, thecWest Australian cartoonist, Alston, has now taken to portraying him with a Nixon like five o clock shadow. It is subtle and sub liminal, but it builds up a picture that Alston wants to portray; shifty and unreliable. It is not true of course, but each day, in every way the conservative media pains that negative portrait of the man. We all need to go to more Bill Shorten town hall meetings. ‘Divide and conquer’ is the Liberal way. Christopher J, he most certainly jogs. I think he goes for a run every day. thank you, Bert. S’what I didn’t like about Scotty or Mal. A good leader jogs. Jonny jogged, but he only did it for the cameras, so that doesn’t count. Tony is just a nutter so he doesn’t count either. Shorten will be remembered way after names like John Howard, Tony Abbott, Malcolm Turnbull and Scott Morrison will mean nothing to the vast majority of Australians…. … and the Liberals know it, that’s why they fear and hate Shorten so much. Five and half years ago I admit that I did not thonk Bill Shorten could achieve the PM role. Bill Shorten has proved by quite persistence that he has all the necessary to become a great Labor Prime Minister. He is without doubt the very very “Quiet Achiever”. With Bill you get decency.